If you have been looking at planners, you might have come across The Well Planned Day. 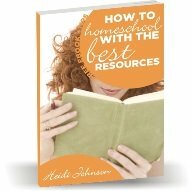 What makes this planner different than others that homeschool moms can use? I was able to interview the creaters of these planners and get some answers for you. Here are the details I wanted to know. Hopefully this will help you get a better understanding of these planners and help you see if these would be a good fit for you. 1. What is The Well Planned Day and what makes these planners different from traditional planners that many people use? Our most popular item, the Well Planned Day planner is an all-in-one planner that not only covers your homeschool scheduling needs, but your home management needs as well! Weekly menu, monthly projects, monthly budgeting, daily bible reading schedule, are ALL included. You name it--our planners have it! Everything you need right at your fingertips! 2. How do the planners work? We have three planner types available: print, pdf, or software. Each person utilizes our planners differently, but we suggest that you use the planner to plan ahead one week at a time or that you use the planner to record your week as you go. The greatest benefit of our planners is that they provide families with the flexibility to utilize the planner in whatever way best suits their needs. 3. What are the advantages and disadvantages to using The Well Planned Day planners for homeschooling or managing a household? One advantage is that the planner can be used to keep a record of your homeschooling activities/lessons. It not only provides daily lesson plans, but also a place for recording grades, attendance, semesters goals, field trips, report cards, etc. Another advantage is the planner's availability in three different types: print, pdf or software. We have a planner for everyone! One disadvantage of our print and .pdf planners is their inherent customization limitations. For example, we have chosen the five most popular subject headings for the lesson planning pages, but many families may use more, or different, subject headings that those we provide. BUT, with our newest planner version - the online software planner - the consumer will be able to customize the planner so much more than is possible with the print and PDF planners. We are very excited about this feature! Here is the link if you would like to check it out: Well Planned Day resources. 4. How much maintenance is required/needed to manage the planners? 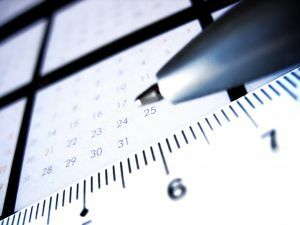 The amount of time needed for planner maintenance is largely dependent on the size of your household, your family activities, your curriculum, etc. Generally, 30-60 minutes weekly should be sufficient to plan your week in all management areas. 5. How long has your company been around and how did you get started? Home Educating Family was first launched about 4 years ago with the publication of a magazine for homeschool families. Soon after, my husband suggested that I publish the planner I had designed to manage our own homeschool. Upon announcing the planner's first release, we were astonished at the thousands and thousands of orders we received. Since that time, we have been dedicated to providing the services and products that homeschoolers in this new digital age are looking for. 6. What types of people enjoy these planners the most? Are there some people who work better with planners than others? 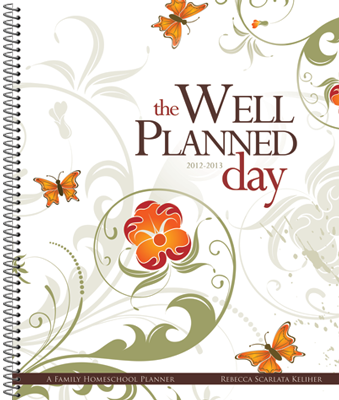 With our most popular planner, the Well Planned Day planner, homeschool moms make up about 90% of our customer base. Our On the Go planner, a basic every-day planner that is small enough to fit in a purse, is designed for use by all ladies--not just homeschoolers! It has most of what the larger Well Planned Day planner has to offer, except for the homeschooling portion. We also publish a line of planners for students in elementary all the way through college. These planners are a perfect fit for all students--whether private, public, Christian, or homeschooled. We also find that our planners are great for all types of people, even those that do not like to plan ahead. Surprised? Because our planners are such effective record keepers, even those who don't plan ahead can use the planner to keep track of what they have accomplished each day - turning the planner into an all-in-one record of their homeschooling journey! 7. Any advice for new homeschoolers or those thinking about using a planner or getting more organized? Remember, each family is unique. There is no formula or product that will produce the perfect paradigm. Recognize your family's distinction and utilize the products that will best fit your family's needs. And most importantly, remember that homeschooling is about relationship with your children. Getting the day’s work done is important, but nothing is more important than developing life-long relationships. Thanks so much to Rebecca Keliher for doing this interview with me and for writing The Well Planned Day so that we homeschoolers can be more organized. I hope this information has been helpful to my readers.